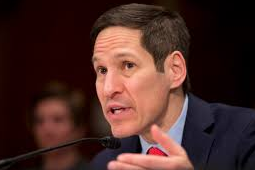 Appointed to his position by President Obama, CDC Director Tom Frieden was fired last night after making the biggest diagnoses of his career. In a now-viral video, Dr. Frieden explained that America is currently suffering from stage 4 cancer, caused by a variety of pathogens (including but not limited to Donald Trump, neoliberal capitalism, and smoking). The prognosis is unclear, but Dr. Frieden expressed hope as well as an urgent call for citizens to advocate for health care organizations such as Planned Parenthood and even the Center for Disease Control Itself. He also cited protesting the tumor, calling Congress, and organizing in one’s community as other effective means of combating the disease. A mere seven minutes passed after the video was released before President Trump fired Dr. Frieden in a dramatic showdown on live television. Candidates for his replacement are rumored to include Sarah Palin and David Koch, neither of whom have medical degrees or any experience in health care. Previous It’s the I’m Traveling the World LiveJournal!